John Dean stands as a legend in the American banking industry for rescuing several financial institutions on the verge of collapse. Nicknamed ‘bank turn-around specialist’, John lead the re-birth of five major baking institutions which included the Bank of Oklahoma in 1980s, which became the most profitable in the State three years after he stepped at the helm of the company. His tenure at the Silicon Valley Bank has also significantly improved company portfolio. In his eight years, assets grew from $935 million to $5.5 billion; employees from 235 to over 1,000; and market capitalization from $63 million to a high of over $3 billion. Having been in the industry for more than three decades, he has gathered the right know-how and experience to become a potent financial advisor to top CEOs and companies. Today, John Dean is a venture capitalist focusing on tech companies in Silicon Valley and Hawaii. And he has made good use of his expertise to be of service to young entrepreneurs and start-up companies. 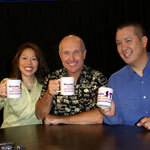 John engages in the non-profit sector as founder of Entrepreneur’s Foundation of Hawaii. He has also started a small venture fund in Silicon Valley more than a year ago. To John passion is what sets a great entrepreneur apart from the rest. He said that the most successful entrepreneurs have blind focus on their objective and commitment to both their business activities and to customers. Watch John Dean as he talks about career transitions, the qualities innate of a successful businessperson, and building relationships with employees. John shares how having one common goal and partaking on common core values can drive a company towards meeting its objectives. Greater Good Radio brings to you a truly inspiring leader. Listen now and find out more. A graduate of Holy Cross College, a former Peace Corps Volunteer in Western Samoa, and a graduate of the Wharton School with an MBA in Finance, John spent 30 years as an executive in the financial services industry, focusing for the last 10 years on technology startup companies. He is presently Managing Director of a small private equity fund, Tuputele Ventures Fund, investing in fund-of-funds, venture capital funds and startup technology firms with investments primarily focused in Silicon Valley and Hawai`i. He is also the managing general partner of Startup Capital Ventures. From 1993 to 2001, John was Chief Executive Officer of Silicon Valley Bancshares and Silicon Valley Bank; and then from 2001 to 2003, he served as Chairman of the Board of the bank and the holding company. During his eight years as CEO at Silicon Valley Bank, assets grew from $935 million to $5.5 billion; employees from 235 to over 1,000; and market capitalization from $63 million to a high of over $3 billion. In 1997 he was recognized by Business Week as one of Silicon Valley’s top 25 “movers and shakers.” In 2000, and again in 2001, Silicon Valley Bancshares was ranked first among the second-hundred largest banking companies in the United States by U.S. Banker, based upon return on equity and growth in per-share net income over a five-year period. In 2001, he was recognized by Forbes as one of the “50 most powerful dealmakers.” And, in 2001 Fortune ranked Silicon Valley Bancshares among the “100 Fastest-Growing Companies” based on growth in revenues, EPS and total market return over three years. Prior to Silicon Valley Bank, John had been CEO of four other institutions. He was Chief Executive Officer of: Pacific First Bank (1991-1993); First Interstate Bank of Washington (1989-1991); First Interstate Bank of Oklahoma (1986-1989); and, First Interstate System, Inc. (1981-1986). Under John’s leadership, these banks, some of which were troubled institutions, grew significantly and became profitable. John is an advisor to and director of various venture capital firms and technology companies both in the United States and overseas. He also serves as director of several non-profit organizations and frequently speaks on topics related to leadership and building successful companies. John is on the advisory board of the Wharton School of the University of Pennsylvania, as well as a committee member for the School’s five-year capital campaign. He is a director of Pacific Asian Center for Entrepreneurship and E-Business (PACE) at the business school of the University of Hawai`i. John was a member of the Board of Trustees of Oceanic Institute, an affiliate of the Hawaii Pacific University. He stepped down from the position in 2005. John also has many years of experience investing in technology companies. He has served as Managing Director of Tuputele Ventures Fund, LLC, a small private equity fund investing in early-stage technology companies and venture capital funds. He is an investment director for various venture capital firms, both in the U.S. and overseas, including Advanced Technology Venture (ATV), Institutional Venture Fund (IVP), Walden International, Leapfrog Ventures, and Authosis Capital. John serves as an advisor or director of various technology companies, including EzRez Software, H-5 Technologies, and BioImagene. He brings a wide network of industry contacts to the Fund, notably in Silicon Valley and Hawaii. John was a founding director of the Entrepreneurs Foundation in Silicon Valley and for a six-month period during 2001-2002, was its interim CEO. John is also a director of HiBEAM, a nonprofit organization that serves as an accelerator for startup companies in Hawai`i, and Chairman of the Emmett R. Quady Foundation, his family foundation.